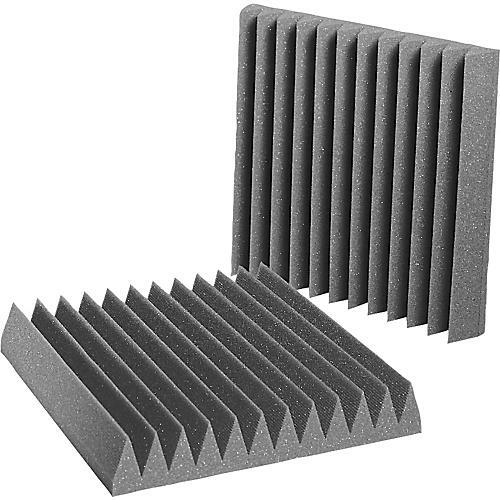 The 4" Auralex Studiofoam Wedges absorb bass frequencies and are recommended for medium to large areas like concert halls, gymnasiums and churches, rooms with pronounced low frequency problems. StudioFoam wedges are designed for spaces where sonic accuracy is mandatory and where acoustic absorption is required (e.g. voiceover or drum booths, forensic audio labs and mastering rooms). 4" acoustic Studiofoam Wedges provide 3X the low-end control of 2" and can effectively tame even the worst sonic anomalies. In some instances, using Auralex Studiofoam can lessen the need for significant dedicated bass trapping. This particular package includes six 2' x 2' x 4" panels which will cover 24 square feet of wall space.